July was a very busy month at the Trellis Center both recreationally and vocationally. With Summer weather upon us, we had so many opportunities to be outside for fun and some work. Everyone here has kept busy with the amount of harvesting as well as planting to be done at this time during the season. Many of our crops have been producing week after week, while others have finished producing which allowed us to plant a second group of crops for the late summer. In addition to keeping our garden beds full, we are trying our hand at growing sprouts and are seeing great results. We were also able to plant pepper starts and watermelons to be ready for harvest later in the season. We are beginning to see some squash and pumpkins appear as the long, hot summer days encourage all of our plants to mature for harvest. While the gardens and greenhouses are keeping us busy, we have also begun to mix our own potting soil. This helps us ensure healthy plants starting in the greenhouse, and promises a smoother transition when we transplant our starts outside. With our garden beds, pepper patch, and greenhouses in full swing we we able to continue making deliveries to both The Yellow Church Cafe as well as bring some fresh herbs and produce to the Ellensburg Pasta Company. We thank both businesses for their support of the Trellis Center as well as TerraVine Growers. We will be at the Kittitas Valley Farmer’s Market August 22nd! 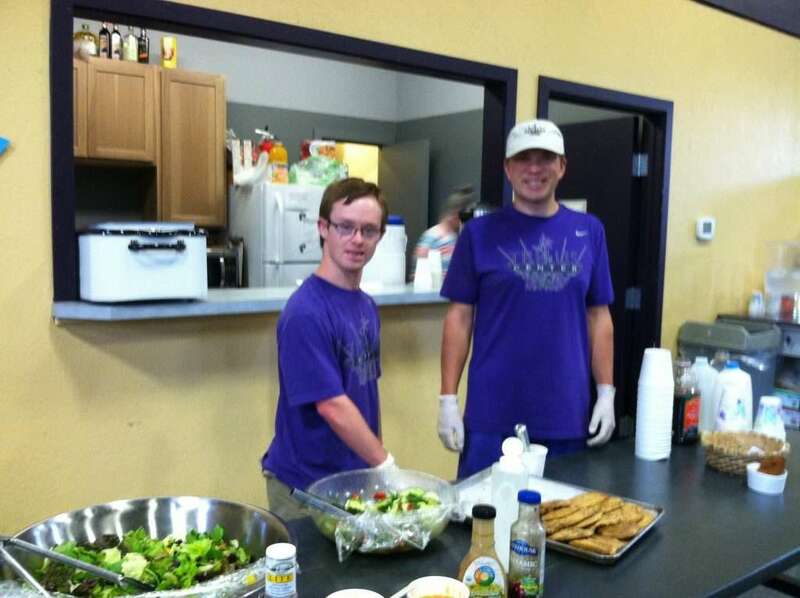 Our recreation program offered us many opportunities for some summer fun this July. We were able to do some great hiking around Lake Easton State Park, as well as have a few picnics along the Yakima River. In honor of Independence Day, the Trellis Center cooked up a patriotic BBQ meal complete with music and some time spent in the pool. The Trellis Center also volunteered our time and talents to the local FISH Food Bank. We were able to help sort and package dry goods to be given to families in need this Summer as well as provide assistance in serving a community lunch to the Ellensburg area at one of FISH Food Bank’s meal locations. It was a great experience to have all of us at the Trellis Center giving back to the community that we know and love. We extend a thank you to all those who support the Trellis Center and their endeavors, and appreciate all the encouragement you give the program. For those in the Ellensburg area, don’t forget to come out and see us at the Farmer’s Markets. For all of our supporters living elsewhere, there a so many ways for you to support us from afar. The Trellis Center has an Amazon Smile account in which a percentage of each purchase is donated to the Trellis Center, all you have to do is go to https://smile.amazon.com/, sign-in to your amazon account, and then search for the Trellis Center. We also always have our paypal in which donations can be made. We appreciate all the support we receive and know that it’s vital for us to continue to fulfill our mission and provide the best program possible to all of our participants.